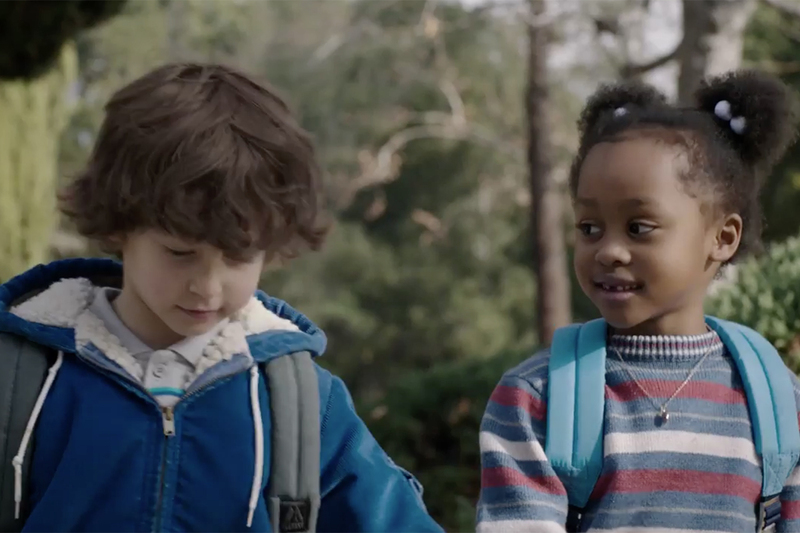 Chase has crafted a relatively progressive and human-focused image in recent times, with the help of New York-based advertising agency Droga5, which created the ‘Mastery 2.0’ campaign in 2016. Spanning four TV spots, the campaign presented various touching slice-of-life scenes where everyday Americans benefit from financial advice from Chase at a life-changing point: an elderly couple take their micro pet pig for a walk to the tune of Shaggy’s “Bombastic” (confident that Chase has their retirement finances sorted out), a dedicated father dresses up as a fairy godmother for his daughter’s birthday party (and uses Chase to set up her college fund), a single mother prepares for a new future for her teenage son with Chase’s financial advice, and a heartwarming childhood friendship between a Caucasian boy and an African American girl survives through high school and college, finally blooming into a stable relationship in adulthood (with financial stability gained with the help of Chase’s financial services). While no Asian Americans were featured in this particular campaign, Chase has broadcasted ad spots which included notable Asians and Asian American actors: the 2015 Mastery campaign featured Taiwanese glass artist Loretta Yang, its 2016 ‘Effortless’ campaign featured Taiwanese street acrobat Isaac Hou, the Chase Freedom TV commercial ‘Amazon: More Fun Out of the Holidays‘ included actor Peter Chao’s appearance as an office worker, while its Chase Sapphire card TV ad featured celeberity chef Nobu Matsuhisa finding culinary inspiration in America’s heartlands. Chase has also commissioned ad spots that featured prominent African Americans such as tennis legend Serena Williams and popular entertainer Nick Cannon, as well as up-and-coming ethnic minority entrepreneurs such as David Ojobaro and Rich Mendoza. 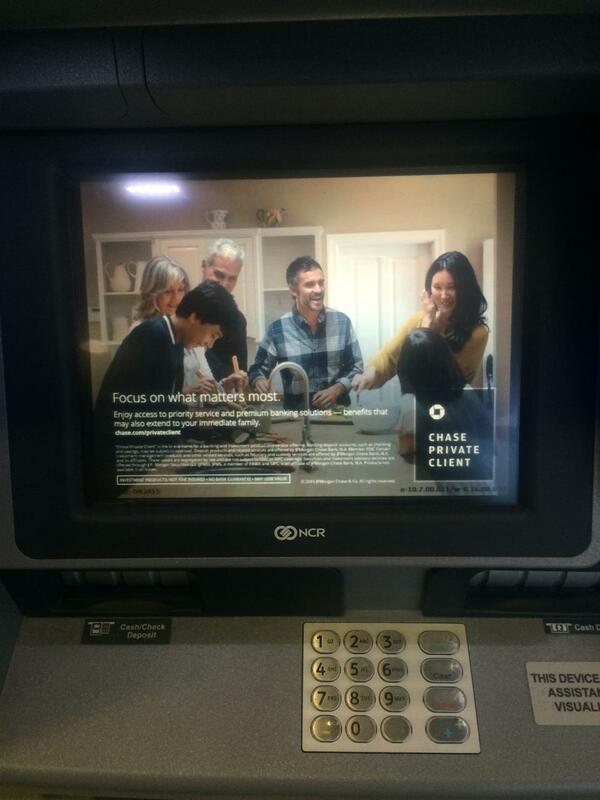 With this ATM visual ad, however, the limits of Chase’s vision of a progressive ‘post-racial’ America becomes apparent. While Chase has been inclusive of ethnic minority entrepreneurs/athletes/entertainers in cultivating its clientele, its representations of American family life remain circumscribed by mainstream whiteness. As Just Add Color’s Monique has observed, media representations of multicultural America in TV, film and advertising “hasn’t moved beyond the binary idea of whiteness being a part of multicultural relationships”. When ‘progressive’ interracial relationships are present, it is most often the white man + ethnic minority woman that is privileged. Representations of straight white male privilege is thus enforced, albeit with a progressive spin and a slight improvement from a lily-white vision of everyday America. As one the Big Four banks of the US, Chase offers more than 5,500 branches and 19,500 ATM’s nationwide. It serves approximately one of out of every six Americans. as the neighborhood bank for thousands of communities across the country. Chase deserves some credit for representing ethnic minority clients (albeit mostly model minority types) and customers as part of the ‘mainstream America’ that it aims to serve and financially empower. It can go much further, however, by moving beyond the common, limited representation of multiculturalism as consisting of interracial couplings between white men and African American women and white men and Asian women to really do justice to America’s evolving ethnic diversity.